As we round out the year, there is a good chance we’ll all be spending more time indoors. Evenings get darker, weather gets cooler and, for perhaps the first time all year, we will allow ourselves to luxuriate in late mornings with the newspaper and coffee, or hot cocoa with a friend on a lazy afternoon. Indoors become romantic, cozy, warm and where we want to be. It is, no doubt, because of these comforts that we enjoy the tradition of holiday decorating, which is a comfort in and of itself. Bearing in mind that we will someday return to the outdoors, swim in the ocean and lay on the grass, we think it appropriate that holiday decorations be as easy on the earth as they are on the eyes. 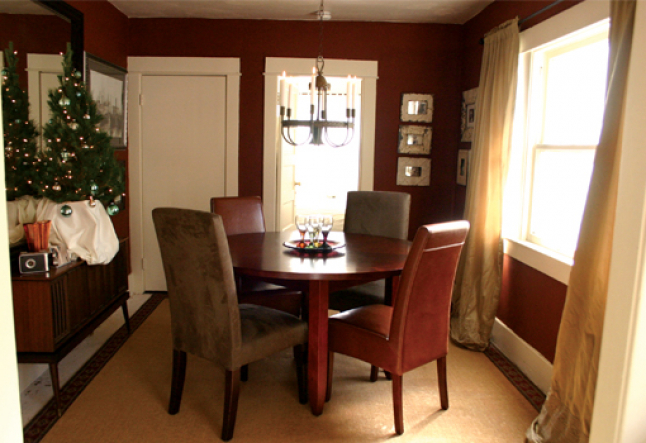 We gave this dining room a green holiday makeover in five steps and then enjoyed the room over brunch. Some people are great with paint and a roller brush. If you are one of them (or know someone who is) there is no reason why you should not spend an afternoon on a wall or two in exchange for a dramatic difference. This is especially true given the fact that, with all of the options available in low or no VOC paints, you no longer have to suffer through days or weeks of “new paint smell” and the cancer-causing molecules that come with it. If you are not a paint person, fear not. You can change the mood of your room with draperies, throws and pillows. For the dining room, we used rust colored paint and moss colored silk draperies both by Anna Sova Luxury Organics (annasova.com). The thing about a cut holiday tree is this: it’s not the worst thing in the world. Tree farms, of course, practice sustainable harvesting; and the trees, when thrown away, will bio-degrade. That being said, there are even better options like this small, living tree, which when the holiday season is over, can be planted. There are many places that offer living holiday trees in all sizes, including most nurseries and even Home Depot. If a living tree isn’t right for you, consider the Delancey Street Tree Farms where your purchase will go to support the San Francisco-based education center that helps parolees and people who have had substance-abuse issues. Call 415.957.9800 for locations. Then there is the matter of what goes on the tree. We used antique ornaments, which we bought on e-bay, in sea foam and silver to offset the rust color on the wall. You might also like to try the recycled glass ornaments from Aurora Glass (auroraglass.org). Nothing says elegance like a chandelier. We found this one (an antique that is no longer electrified, but now holds taper candles) at Tony’s on Abbott Kinney in Venice Beach for only $40! Whether you chose to employ a chandelier or not, try the clean-burning soy candles from Aroma Naturals (aromanaturals.com) and palm wax candles from Aloha Bay (alohabay.com). In a corner of the room we displayed photos from past holidays and at our brunch they became a source for a great conversation because of the memories that they sparked. 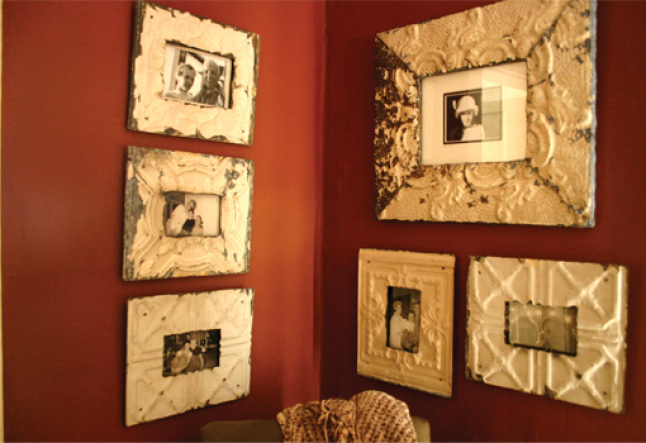 To do this, we recommend using your existing frames or frames that are made from recycled materials, such as these, made from architectural salvage from Dryad’s Dancing (dryadsdancing.com). No room is complete without a few lovely pieces to highlight. We used a recycled glass vase, platter and wine glasses by Fire and Light (available at earth-accents.com). May your days be merry and bright and may all of your holidays be green. Kelly LaPlante is the Principal Designer and owner of Organic Interior Design. 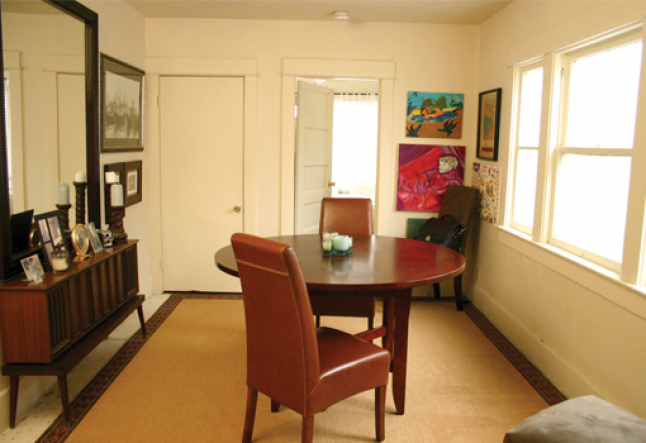 Many of the furnishing used in this room can be purchased through her firm and retail store in Venice Beach.